Vignettes a big part of creating a beautiful home. If we could only have a fool-proof way of styling one so it would look fabulous every time. Well, we are in luck. Designers know some tricks and tips that help them create masterpiece vignette and you can too! Here are 10 elements that beautiful vignettes should incorporate. 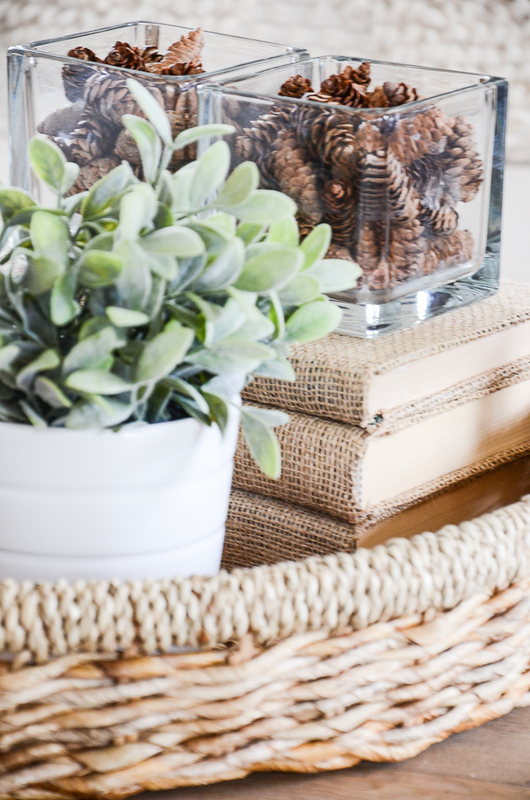 With a little practice, you can style a vignette like a pro too! 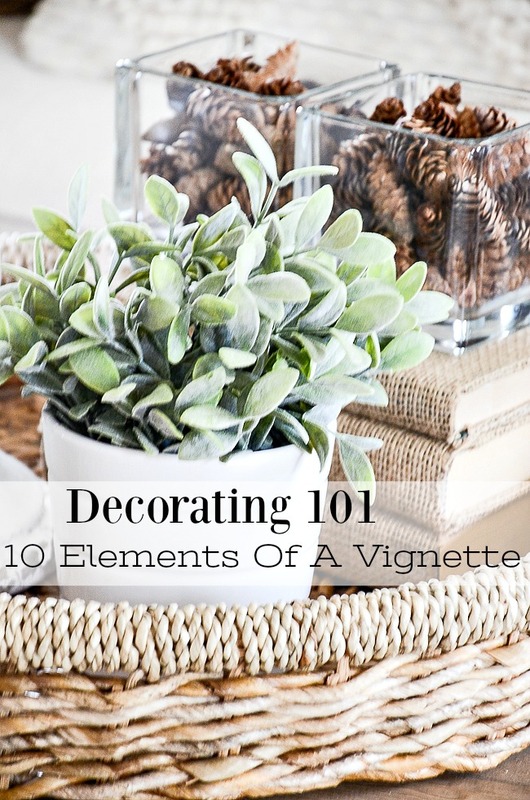 Because this is a “decorating 101” post lets get familiar with the design element we will want to incorporate into a vignette. Here are 10 things to keep in mind when styling a vignette. Let’s start with the very basics. A vignette is a grouping of objects that create an interesting focal point. For me, a vignette is easier if it is created around a theme. Because a vignette should tell a little story it’s important to think about a theme before doing anything else. The easy vignette I am using for this post is a transitional theme. Going from early fall towards Thanksgiving and Christmas. Putting your vignette together in something give it boundaries. It’s not necessary but it makes your grouping of objects look like they belong together. It’s best to start a vignette by bringing together lots of options for it. I like have all potential items to go in a vignette before me. Give yourself something to “play” with. Give yourself something to “play” with. Even the savviest designers do this! Chose a color palette that works with the room a vignette will live in. I tend to keep my color palettes very tight. It gives the objects in a vignette a cohesive look. Items in a vignette should have different heights. It helps our eyes bounce from one thing to another in the vignette and our minds translate that as interesting! Items on the same visual plain are boring! If the things you think would work well in a vignette are the same heights, use books as risers to make them taller. I am addicted to texture! Texture translates into interest. 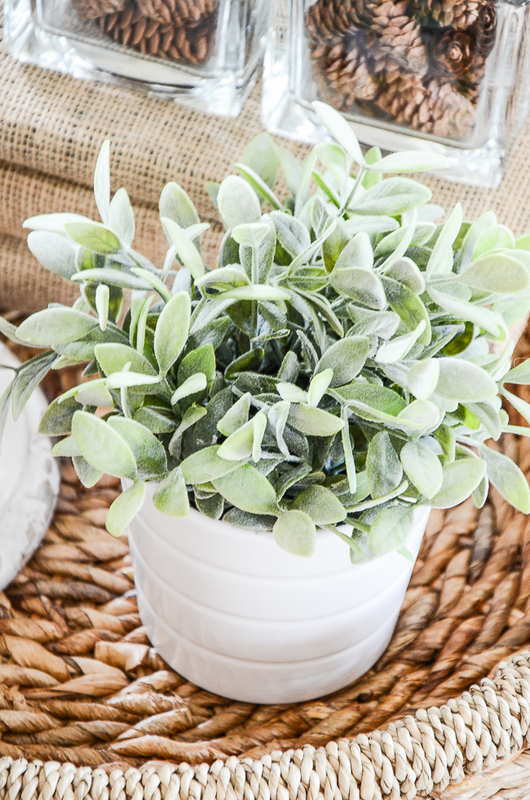 One of the most important elements to use in a vignette is texture. You will want to use different textures within the same vignette. Another important way to create an interesting vignette is to layer objects. 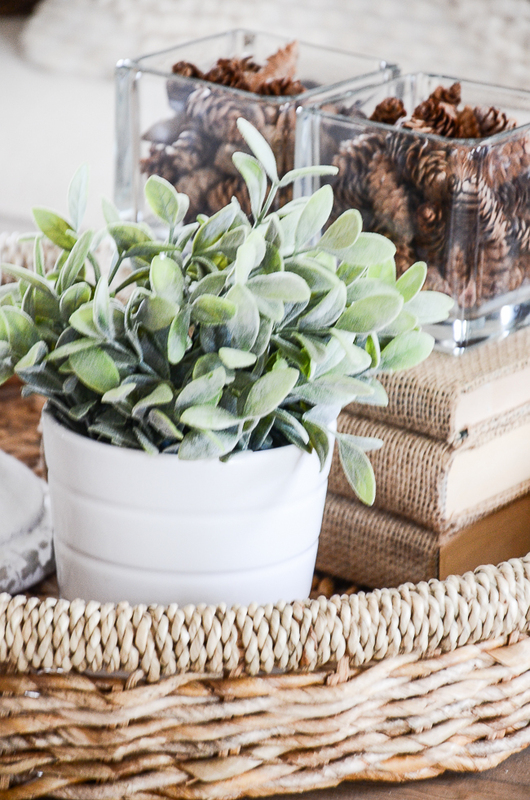 Think about perching something on top of a small stack of books or putting a little plant in a pretty bowl. Don’t get too crazy with the layers. A layer or two will be perfect! Naturals are things that are living or have lived. And we are partial to living things!!!! Our eyes will actually seek them out. 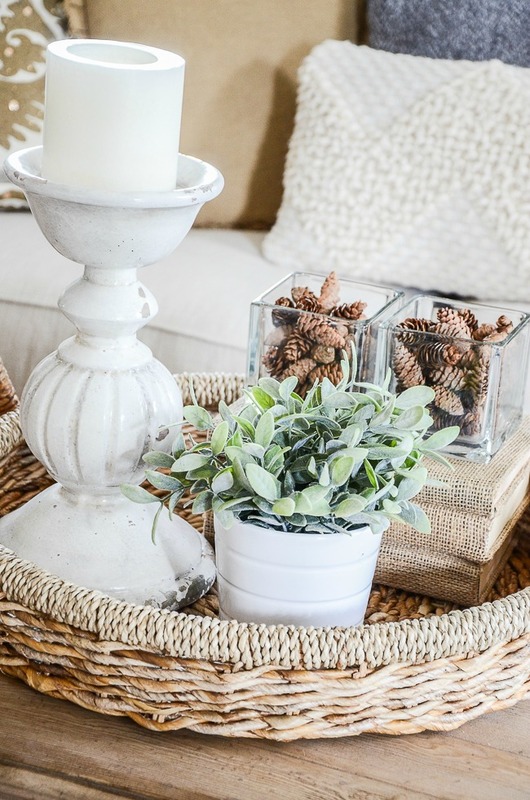 Make sure you have at least one natural element in a vignette. Almost always an odd number of objects is more pleasing to look at than even. Our brain does some subconscience math an loves certain configurations and groupings. Three is a big pleasure! When creating a vignette keep this in mind! The vignette above is grouped into three. 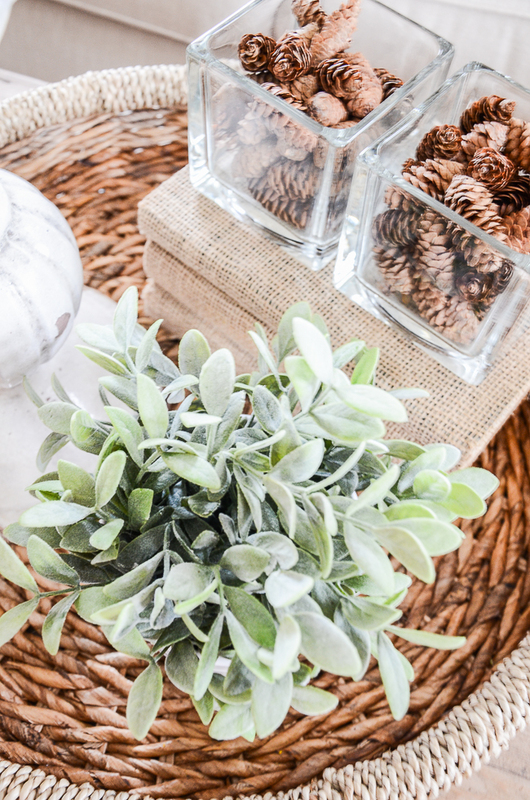 The candle, the plant, and the books and glass cubes of pinecones act as one. Don’t be afraid to keep a vignette very simple. Even just three items. Too much is too much. And often less is best in a vignette! Cull down and choose just the very best items that work together! Now YOU have the elements designers use to style a fabulous vignette! How about making one for your home today? I love your gorgeous photos! What an easy but visually stunning centrepiece. LOVE what you have shared here! 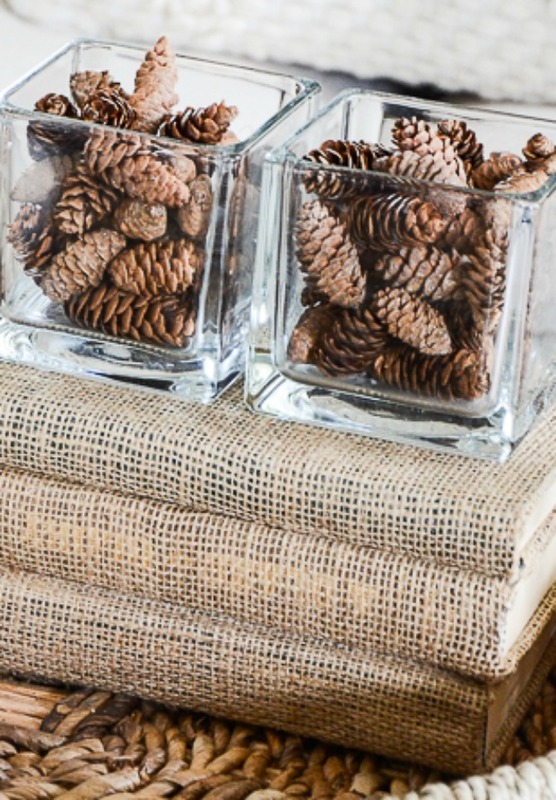 I have those small glass vases and now can make another use of them by filling with pine cones come fall……..though I will gladly wait because I’m eager for warmer weather right now! ha THANK YOU AGAIN for sharing such ‘can do’ things!! Thanks for so many suggestions. I have one glass container like the two stacked on the books in the vignette. Now I know how to use the pine cones differently this year. I love NOT having to pay an arm & leg for YOUR professional advise. Yvonne. 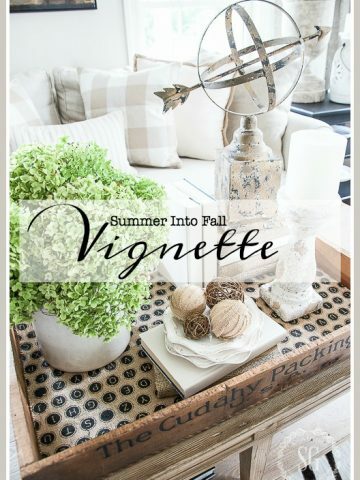 Love your blogs about creating vignettes. Funny about our brains and odd numbers! I usually keep my groupings to three items on a tray and always try to add an item from nature . My family room vignette for summer has a large piece of coral,a carved wooden shore bird and a pottery vase hand turned in one of my states potteries. If I have some pretty flowers I will put them in the vase but either way it looks good. So much fun to put things together till they are just right. I appreciate your blog so much. Our living room is in transition mode and so I’m paying attention to the creative ideas you show for inspiration. I haven’t tried your recipes but that’s next on my list! I appreciate your Christian witness, too!! Thanks for all your efforts to encourage beauty in this world! Hi Yvonne!! Just wanted to say that I love your blog and all your fun ideas and recipes. I have been with you a while now. Just would like to say I feel like it would be nice to see more ideas of each post. There are too many pictures of the same thing. How about a few different tray idea vignettes instead of a dozen of the same picture. I do many tray vignettes and would love more ideas. Thanks! I love your tips on decorating. Your home looks so cozy. Love your pics and tips! Thank you! 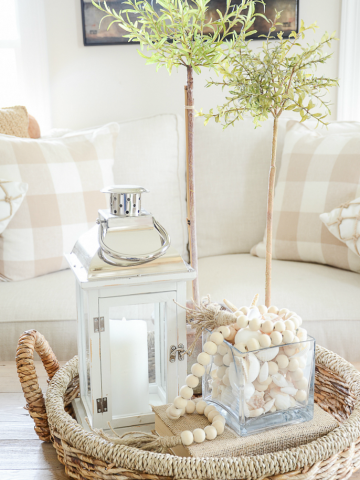 Loving all the natural elements in this vignette. Unfortunately vignettes do not come naturally to me…definitely something I have to play around with. Great tips! I always enjoy hearing your thought process behind the design. I’m also loving those pillows on your sofa. We all love a pretty and interesting vignette, don’t we??? Texture is such a wonderful element in all decorating projects, but I think it is overlooked sometimes. I love lists and appreciate your tips in a 1, 2, 3 format. Your teaching background continues to provide great benefits to others. We are all just overgrown first graders at heart. This is great Yvonne, thank you. Tablescapes I have no problem with. When it comes to vignettes I’m always stuck. 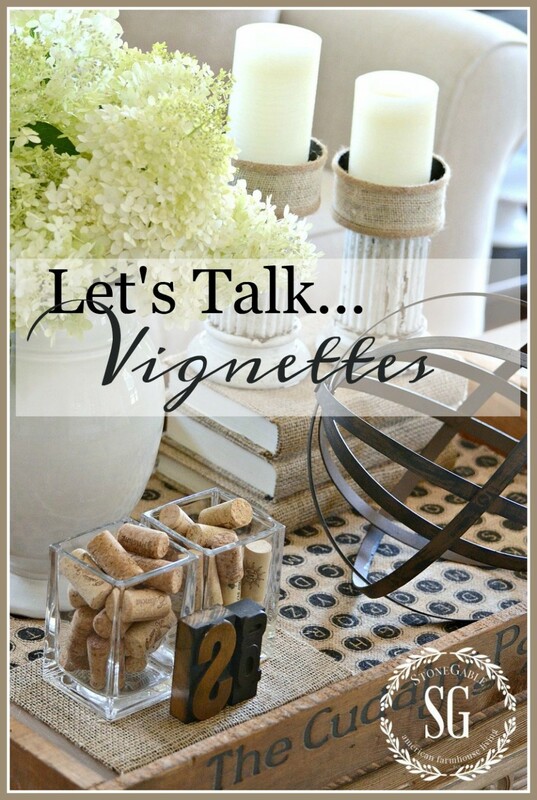 Love vignettes…..and I’ve gotten so much inspiration from your blog! Thank you! 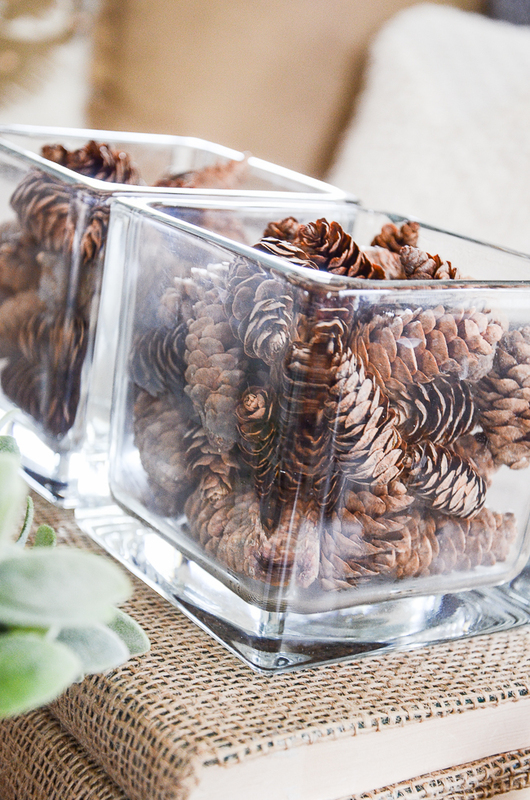 Thanks for the idea of pine cones in square glass vases, I have both, going to fill some up now! Thanks for the great tips! 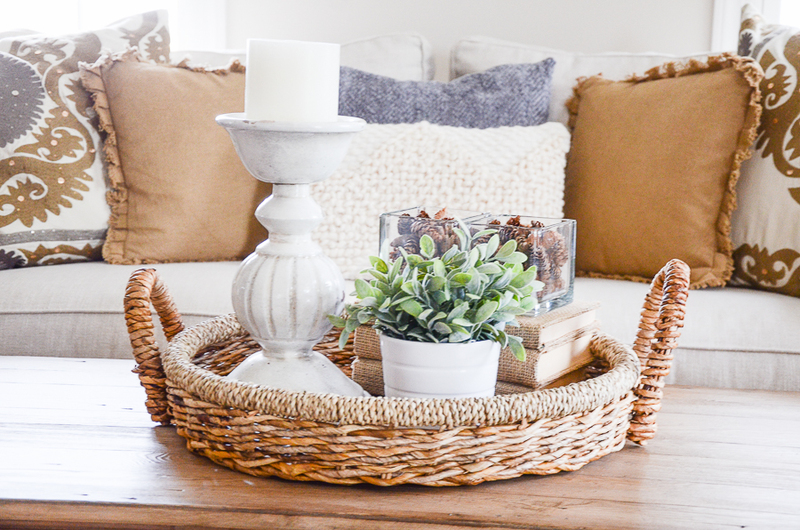 I just edited my coffee table vignette since I had too much in it. Looks much better now. My decorating has improved drastically since I began following your blog and using your tips. So thankful for your expertise. Your vignettes are always so inspirational. Love learning the thought process behind them! Great tips! Thank you for sharing how you do your vignettes. I honestly learn something new from you almost every day! Thanks for the great tips.It’s easy to get carried away, sometimes the editing is the hardest part !! Yvonne you make the most beautiful vignettes and I have tried to copy a few with good results! I can’t wait to see what you have up your sleeve for Christmas vignettes. No doubt it will inspire us all. 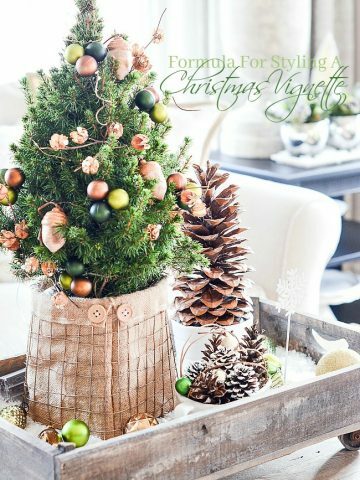 Thanks for sharing those wonderful tips for creating a vignette. It is so helpful to know how to put one together. It was extremely helpful! Many thanks! Thank you for such a thorough post. After reading this post, I feel empowered. You have a way of breaking things down and showing “how simple” it can be to create a vignette. I knew many of your tips, but it felt good to be reminded of them and your photos are great, as always. Thanks for sharing! Thank you for explaining how to design vignettes. The more I do them, the easier it does get. I have friends comment on them,saying how pretty they are. Thank you Yvonne..? I love vignettes! Yours are always my favorite, and thank you for the tips! 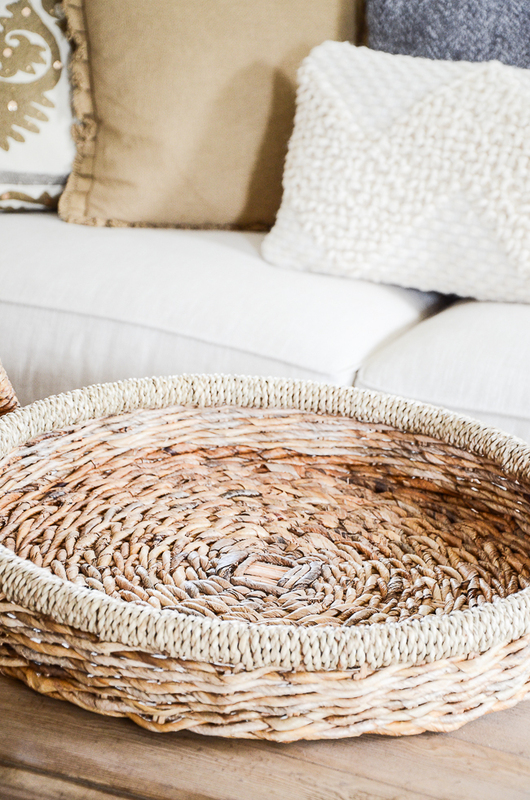 Can you please tell where you purchased the lovely woven round tray? I’ve admired it in many of your photos. It’s gorgeous. Hi Becky, I found the round basket a few years ago at HomeGoods. If you have one near you look there. Our HomeGood’s carries the nicest baskets. Thanks for the great tips for putting together awesome looking vinnettes. I like your burlap covered books in your large round basket on your coffee table. Have a great day! You always have the greatest lessons to learn! Thank you for always explaining !